There are all kinds of drinks that you can serve at a holiday party, but you can never go wrong with eggnog. It’s a classic holiday drink that has been around – and enjoyed – for centuries. 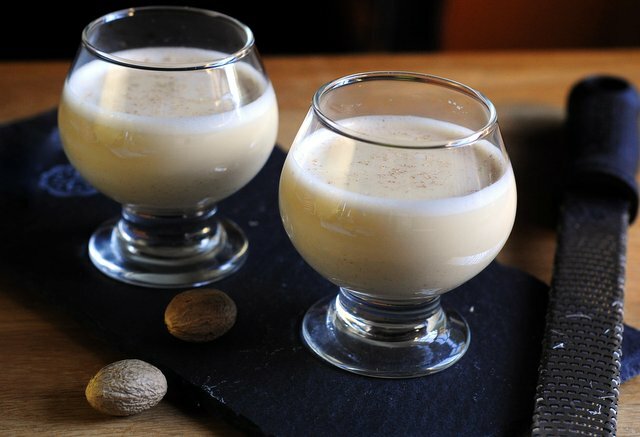 Our modern eggnog probably began as a medieval posset, which was a hot, spiced, alcoholic milk punch. Most eggnog recipes are very similar. They are typically made with eggs, sugar, milk or cream, and a splash of brandy, bourbon or rum. Vanilla and ground nutmeg are added for flavor, as well. Many eggnog recipes are cooked, giving them a thick and almost pudding-like texture. 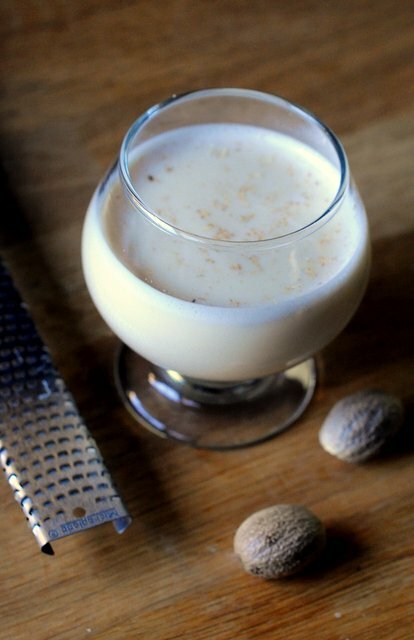 This consistency is what you’ll find in a lot of store-bought eggnogs. This particular eggnog recipe is uncooked, with a lighter texture that is a lot more refreshing than the thicker versions and a lot more traditional. I recommend using pasteurized eggs, which are available in most markets, in this recipe. It is slightly sweet, with a good balance of egg, vanilla and nutmeg flavor. Brandy is probably the most traditional spirit to add to eggnog, but I am a fan of rum in my eggnog, so I use a blend of both spirits in my version. I use a stand mixer to make up this eggnog, and I often double or triple the recipe to serve a big crowd. If you don’t have a stand mixer, you can use a hand mixer or just a large bowl and a regular whisk to whip up your batch. Using a stand mixer with a whisk attachment, whisk together the eggs and sugar until light in color and the sugar is dissolved. Add the rest of the ingredients and whisk until incorporated. Transfer the nogg into a pitcher and chill overnight in the fridge. Garnish each drink with grated nutmeg before serving.